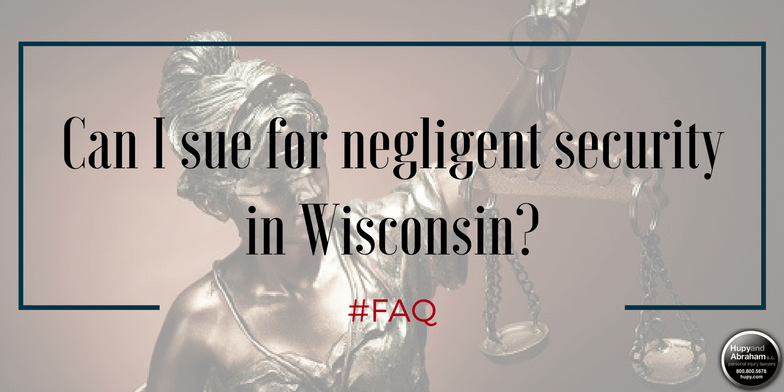 Standing to Sue for Negligent Security in WI | Hupy and Abraham, S.C.
Can I sue for negligent security in Wisconsin? Do You Have Standing to Sue? You are a legally competent adult and you were hurt in a negligent security incident. You are the parent or guardian of a minor child who was hurt in a negligent security incident. You are the guardian of an adult who was hurt in a negligent security incident. You are the executor of your loved one’s estate and your loved one died in a negligent security incident. If you file a negligent security lawsuit and you don’t have standing, then the defendant will raise that argument with the court and your case will be dismissed without your receiving any financial compensation. However, if you have standing and can prove your negligent security claim, then you may be able to recover damages. The property owner owed you (or the injured party) a duty of care. The property owner breached that duty of care by failing to provide reasonable security. You (or the injured party) were hurt because the property owner failed to provide reasonable care. You have the legal right to recover damages. These are not easy standards to meet, and negligent security cases may be complicated. Accordingly, it is important to have an attorney working on your side, explaining how negligent security cases work, and fighting for your fair and just recovery every step of the way. If you are wondering whether you have standing to bring a case or if you would like to learn more about your claim then we encourage you to contact our experienced personal injury lawyers today for a free consultation. Our legal team is available around the clock. Simply call us at 1-800-800-5678 to learn more.